MacLeod, Richard Allan, 75, of Milton, passed away in Queens General Hospital, Liverpool on Thursday, August 18th, 2011. Born in Milton, he was a son of the late Marguerite (MacDonald) and Donald MacLeod. He was a loving husband, father, grandfather and friend. Richard started working at the age of 13 with his father at the family garage. He worked there for 28 years while also driving school bus. He then went to work for the Bowater Mersey Paper Co. for the next 15 years, retiring as fire chief of the mill. Richard served in the Liverpool fire department for 32 years, spending a number of years as chief. 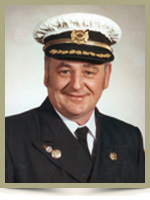 He was a lifetime member of the Maritime Fire Chiefs Association. He was the founder of the Liverpool Junior Fire Department and also helped to pass legislation for benefits for members of volunteer organizations. Richard was a huge fan of the Toronto Blue Jays and in his spare time he enjoyed trucking with Arthur DeMone. In his later years he enjoyed being a snowbird, spending 19 years camping in Florida, and camping with his friends at Seabreeze FCRV. He is survived by his loving wife of 54 years, Doreen; son Ricky of Western Head; daughter Trina of Kempt; grandchildren Christopher, Makayla and Adelaide; sisters Ruth (Bob) MacDonald, Marina Jesso and Stephanie Wilson all of Milton and Barbara MacLeod of Mill Village; brother Reginald (Gwendolyn) of Sandy Cove. He was predeceased his brother Phillip. To Richard’s family I wish to extend my sincere condolences. Richard will be sadly missed and fondly remembered by all that knew him. Dear Barb & Family we are so sorry for yr loss. Gone but never forgotten. God bless you all. We are so sorry to hear about your loss. you and your family is in our hearts and prayers. Our sincere condolences to the family. Our thoughts and prayers are with you during these difficult times. I worked with Richard driving school buses, worked under him at the Liverpool Fire Department and always respected him as a fellow worker and friend. So sorry to hear of the sad news, we send our condolences. We were so sorry to hear of Richard’s passing, but on the other hand we are relieved that his suffering is finally over. He is in a better place now and can rest. If there is anything we can do, please don’t hestiate to ask. We are just up the road and only a phone call away. We are sorry to hear of your loss. Our thoughts and prayers are with you all at this sad time. Doreen, Ricky and Trina….I was saddened to hear of Richard’s passing. Richard was a wonderful man who always made me smile. He will be missed by many, but his memory will live on forever. May you find peace and comfort in friends and family who surround you during this difficult time. RIP Richard. We were sorry to see of Richard’s passing, take and cherrish the memories of your family and friends. We are sorry to hear of Richards passing, He gave a strong fight and will be remembered and missed by many.Our thoughts are with his whole family. We were sorry to hear about Richard. Our thoughts and our prayers are with your family. Ricky…so sorry to hear of the passing of your father. May your good memories guide you and your family through this difficult time. Take care and God bless. So sorry to hear of Richard’s Passing, We send our condolences and prayers to you and your Family. He is now free from pain and now at rest. May God be with you and your Family!!!! If there is anything that we can do Please let us know. So Sorry to hear about Richard. May God give comfort to the family in this time of sadness. Our condolences go out to you all in the loss of Richard,he was a great person and will be missed dearly.Hold on to the memories. Trina, Ricky, Doreen and family: our thoughts are with you. So sorry to hear of your loss, may you find comfort and strength in each other in the days to come. So sorry to hear of your loss. Our thoughts and prayers are with you during this difficult time. May your memories of the past bring you comfort. Trina and family: We are sorry to hear of your loss. Our thoughts and prayers are with you at this sad time. TO DOREEN AND FAMILY I SEND MY DEEPEST SYMPATHY!MY MY THOUGHTS ARE WITH YOU ALL AT THIS DIFFICULT TIME! Sorry to hear of Richards passing.Our thoughts & prayers are with you all at this very difficult time. I’m so sorry to hear about Richard.My condolences. Barb and Family, So sorry for your loss. Our sincere condolences to you and the family. May God be with you at this time of need. Our thoughts and prayers are with the MacLeod family at this time. to doreen and family sorry to hear of richards passing. we send our condolence to you and your fam0ily. So sorry to hear of your loss. Our thoughts and prayers are with you during this difficult time. May your memories bring you comfort.R.I.P. Richard. So sorry to read about the loss of Richard. Just think of the good times you both had in Orlando with Mom and Dad, (Shirley and Frank Trainor). R.I.P Richard. Doreen and family – so sorry for your loss.Thinking about all of you at this sad time. We are so sorry for your loss. Our thoughts are with you and we hope your memories will comfort you at this time . So sorry to hear of Richard’s passing. Our thoughts are with you at this difficult time. My thaughts and prayers go out to all of you at this most difficult time. Doreen Ricky and Trina, God has once again taken a very special Husband and father, I was one of the first who served under him as a Jr. Firefighter and then as a regular Firefighter,Some of my foundest memories of Richard are from the Firefighter ball team. Our thoughts and prayers are with you and your family at this time. Richard was a wonderful friend and fellow camper. We will miss him. Our heartfelt sympathy at this very sad time. Our sadness is deep to hear of Richard’s passing. We have alot of great fun memories of Richard camping at Ponhook and going to the local suppers. We will miss him dearly and will never forget him along with alot of people. He will always be a legend in our mind. Our prayers and love are with the family. Our deepest sympathy on your loss. Our thoughts are with you at this time. Sorry we are unable to make it to the funeral but our heart and thoughts are with you. Cried deeply today and just wondered if he was o.k. upstairs or wherever he is and likely knows that many truly cared. Charlie is affected deeply. When ever was with Richard, there was simply something so delightfully special. He sure loves his family. In your time of sadness, thoughts of heartfelt sympathy are with you all. We have many good memories of spending time with both of you in our younger years. My deepest sympathy to the family of Richard. I always enjoyed working with him and I truly enjoyed spending time in his company.I will also never forget the hospitality he and Doreen provided for myself and my mother on our respective trips to Florida.He was a great guy and I will always have great memories. Dear Doreen and family. Nothing you can say at a time like this. I know I have been there. We had such great times with all that we did.. Too much to mention. How life changes in the flash of a second. I am always there if you need me. Our prayers are with you. Love always. Merla, David, Ted and Susan. Our deepest sympathy to you and your family. We will never forget the first time we went to Florida and you and Richard showed us around. So sorry for your loss. Richard was a great person and will be missed by many. Our thoughts and prayers are with you at this very difficult time. Dear Ricky, Trina, Mrs. MacLeod and family, please accept our condolences with Richard’s passing. Our thoughts are with you, take care. We have many good memories. Our deepest condolences to you and all the family . My throughs goes out to the Family, He was a well know person , My God Bless. Debbie & Maynard Carrier. Doreen, Ricky and Trina. So sorry to hear of the passing of Richard. I spent a lot of time at your place years back while David was doing work for you. Our thoughts and prayers are with you in this difficult time. May you find comfort in each other and know now that he is pain free and is another one of God’s angle’s. RIP Richard! My thoughts and prayers are with you and the family at this time. We were saddened to hear of your father’s passing. during this difficult time .